Bangladesh launched technology-based platform to monitor the national programmes integrated with Sustainable Development Goals (SGDs) which is considered as first of its kind in the world. Prime Minister Sheikh Hasina inaugurated the web portal (sdg.gov.bd) better known as ‘SDG Tracker’ while attending a high-level side event titled held on Wednesday at UN Headquarters, New York, said a news release of Access to Information (A2i) programme. A2i programme with technical support from UNDP and USAID developed SDG Tracker aimed at creating a data repository for monitoring the implementation of SDGs, to strengthen timely data and improving situation analysis and performance monitoring of achieving the 17 goals of the SDGs along with other national development goals. Prime Minister also unveiled a book jointly published by Bangladesh-UNOSSC joint publication on “South-South in Action: Citizen-friendly Public Service Innovation in Bangladesh”. 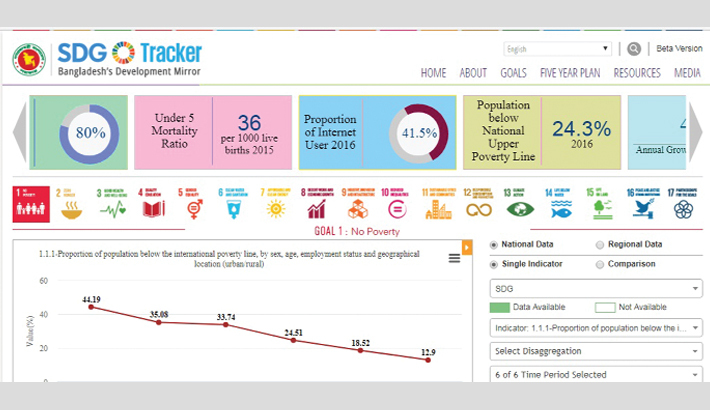 Bangladesh has developed an innovative whole-of-government tracking, measurement and analytics platform called the SDG Tracker. Many countries of the South have expressed intent and taken measures to track progress towards attainment of the Sustainable Development Goals. Estonia President Kersti Kaljulaid, Kingdom of the Netherlands’ Curacao Prime Minister Eugene Rhuggenaath and , Nepal Deputy Prime Minister Krishna Bahadur Mahara were present also present on the launching event. The event was designed to make progress towards actualizing the South-South Network for Public Service Innovations proposed by the PM in last year’s UNGA side-event. Bangladesh has been proactive in sharing its achievements in public service innovation with the governments of Fiji, Benin, Bhutan, Kazakhstan, Maldives, and Singapore, among others. A2i Policy Advisor Anir Chowdhury the government gave a presentation on Bangladesh’s South-South Cooperation and SDG Tracker while Ambassador Masud Bin Momen UN Secretary General’s Special Envoy spoke on the occasion. In another programme organized by Estonian mission in New York, ICT State Minister Zunaid Ahmed Palak said SDGs would be achieved through activities of e-governance programme in Bangladesh. State Minister for ICT Division Zunaid Ahmed Palak has hoped that Bangladesh would be able to achieve Sustainable Development Goals (SDGs) through the efficient uses of ICT derived from the spirit of ‘Digital Bangladesh’. “The goals of Digital Bangladesh for 2021 are in alignment with the SDG goals and those have been translated into e-Governance initiatives to support the eradication of poverty, ensure food security, improve access to health and education services, develop talent for the 21st century, provide equitable services for women and people from all economic, religious and ethnic backgrounds,” he said, reports BSS. The state minister said these while delivering a keynote speech at a discussion titled ‘e-Governance: Partnerships for Achieving the SDGs’ that was arranged by the Estonian Mission at the UN Headquarters in New York last night (Wednesday). “Keeping this in mind, Prime Minister Sheikh Hasina has assigned a high level secretary of the government as the SDG Coordinator to track and monitor the progress of SDG implementation across all ministries. An online data repository — SDG Tracker — has also been developed to accurately monitor implementation of initiatives to achieve the SDGs. So, I believe, SDGs would be achieved through the efficient uses of ICT that was derived from spirit of Digital Bangladesh,” Palak added. Other discussants including Estonian President Kersti Kaljulaid, Minister of Economic Planning and the Director General of National Planning Commission of Namibia Tom Alweendo, Minister of National Planning of Colombia Luis Fernando Mejia commended the initiative of Digital Bangladesh.